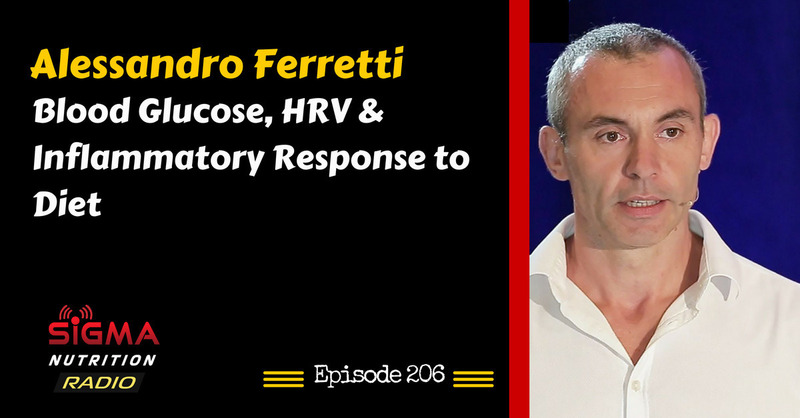 Episode 206: Nutritionist Alessandro Ferretti discusses data he has collected that may inform us as to the inflammatory response to diet and lifestyle, using markers such as blood glucose, heart rate variability and Alessandro’s metric of “HRV/BG Index”. Alessandro graduated from the Institute of Optimum Nutrition in 2001 and formed Equilibria Health Ltd in 2004. With a growing team of Nutritionists and a Medical Doctor, Equilibria Health is now recognized as one of the UK’s leading providers of nutrition education. Alessandro personally delivers postgraduate seminars & master classes for selected, high quality supplement manufacturers and retail chains. In addition, Equilibria Health Ltd have also instigated an ambitious programme of clinical workshops which has been consistently well received. Alessandro practices from the Centre for Health and Human Performance (CHHP) at 76 Harley Street, London, and at Tudor Medical Group in Stratford Upon Avon. Over recent years, he has received two nominations for CAM Best Practice Award for clinical excellence. The Centre for Health & Human Performance is an exclusive multi-disciplinary centre with over 30 specialists taking the client on a holistic journey of assessment, diagnosis, and treatment – using conventional and advanced medical care. At present Alessandro is working alongside the doctors and professors at CHHP researching a group of diseases including obesity. Merging his nutritional findings with those of the medical team, the long term aim is to develop the project into a format that could be presented on a large scale. DANNY LENNON: Alessandro, welcome to the podcast. Thank you so much for joining me today. ALESSANDRO FERRETTI: Oh thank you for having me. I’m a great fan of your show Danny. DANNY LENNON: Very kind indeed and I’m actually really looking forward to this conversation. Some of the conversations we’ve had previous to the recording of this episode I’ve found very intriguing and I really like not only the work that you’re doing but the way you try and think through these problems and try and investigate them and look for data that’s able to maybe clarify some interesting questions and look at it from a different angle. So before we get into that I’ve got a nuts and bolts of today’s conversation. Just for maybe people who haven’t came across you or your work before Alessandro, can you give a brief overview to who you are and what it is you’re doing? ALESSANDRO FERRETTI: Sure, I’ll do my best. I qualified as a nutritionist from let’s say a supposedly science based college and then I got into the real world and starting to observe very different behavior from what we were actually taught. So I decided to do my own research after having practice in different medical teams and different clinics and I discovered that I just really love researching and trying to understand metabolism and how the body works especially in the sport performance. So in the last few years I’ve been mainly focusing on researching metabolism and including also heart rate variability and also looking at the whole energy expenditure and the caloric estimation. DANNY LENNON: Perfect and I think we’re definitely going to dive deep into some of those topics. Before we get to some of that stuff I think maybe a useful way to lead into some of those markers that we’re going to discuss is maybe first getting everyone on the same page and clear on some topics we hear about quite often but maybe some of the context or nuance gets lost on. And I think the first one around this discussion I’d really like to hear your thoughts on is around blood glucose because as we’ve talked about before this is something that is becoming very easy for people to get hold of for themselves so it’s cheap, it’s easy to get. More and more people are interested of looking at their own blood glucose or trying to get these different markers that may inform them about their health or recovery and so on. However, there’s probably good and bad ways to use that so the first thing is when we’re talking about a healthy or normal fasting blood glucose number what should we think of that as and then what are some of the basics around how what we do diet wise that may influence that that maybe people sometimes have some misconceptions around? ALESSANDRO FERRETTI: The reason why I got to research the topics that I have been researching in the last few years is because given a reasonably good diet as you would expect a nutritionist or a qualified nutritionist would have with sport and what we would define a good healthy lifestyle, my glucose level was starting to be constantly above the 5.5 millimolar and given my lifestyle there wasn’t that much to improve, I thought at the time and I started to wanting to know more. So through the course of the years if you look at the work of Dr. [Bryan] Walsh for example and many…well a few of the reviews available now in research, any level there’s constantly above 4.6/4.7 millimolar has been associated with on course glys mortality. Some of the data was not adjusted for age, gender and et cetera but it is already a starting point. So generally speaking if we look at a specific figure, I’d like to keep between 4.5 and 4.7 as a generally optimal level. Obviously someone is insulin resistant or is affected from metabolic diseases or inflammatory response. Obviously this is a slightly different scenario but yet that would be an ideal target if his blood glucose could be a little bit lower. Estrogen seems to also help…it correct female cycle would tend to maintain a slightly lower glucose regulation. Of course there are people they are normally in the 4’s and other people they are normally in the 5’s, they are totally healthy but generally speaking on mass population data, 4.6/4.7 is what I would want to aim at. DANNY LENNON: Maybe an interesting part of this is if we have that as these baseline fasting blood glucose figures on average even as a starting point of somewhere around here might be a good place to aim for, how should people start using blood glucose measurements because as we’ve discussed there are a host of different ways to do that and some may give you results that actually aren’t all that informative. So if someone was going to track blood glucose measures, how would you number one, recommend they do that and then on the flip side of that, what are some of the pitfalls or problems people run into when trying to track blood glucose? ALESSANDRO FERRETTI: Absolutely brilliant question because the most common mistake I see when I coach other practitioners or lecture to medical profession is that things are taken out of context. So especially belonging to different groups I see there are often people take a certain data from a certain subset population and transport it into a completely different of subset populations. So these are things that are very, very important to take into account and in my view it is exactly the same in when and for how long people should actually check the blood glucose levels so there has to be a purpose. So the first thing I tend to ask people, “Okay, why are you wanting to measure blood glucose?” As trivial the question sounds but it is I think very important to put it in the right context. So if someone is pre-diabetic or wanted to lose weight then there would be a certain methodology where for example post-prandial measurements may become quite important on top of the fasting. If someone is wanting to check inflammatory response and we may get into this later then perhaps only the fasting glucose level could be perhaps something to monitor. And given the trend of people recently wanting to measure glucose, I often see a complete kind of breakdown between the purpose and the application of the measurements. So things are taken completely out of context and I see people measuring 10/15 times a day when perhaps only one reading would be more than sufficient given the purpose that they have, given the context in which they are in. So generally speaking, for general health maintenance and to perhaps look at sport applications maybe one or two readings first thing in the morning may be more than plenty and perhaps once a week or twice a week someone wants to check what is their post-prandial curve for example that seems to not be very taxing as far as compliance because obviously compliance is very important. When we deal with athletes, athletes is a great subset to work with because they have very high motivation. So you say it normally they do it, normally but if you then take the average person and asking the person to check every post-prandial two, three times plus the fasting plus the retiring measure then suddenly they have six, seven, eight times in which they have to take a measurement. So leaving aside the cost I think once you measure a certain curve for example you may want to check how the body is at very specific milestones. So perhaps after the first initial month of protocol maybe the readings may be more frequent, after two to three months and we see improvements maybe delay these kind of spot checks that people can do. I’m not sure if that makes any sense. DANNY LENNON: Yeah, no that makes perfect sense and I think maybe a natural follow on question that I’d be intrigued to hear your thoughts on is if we start considering the influence of particularly the macro nutrients split of a diet on blood glucose is something that again maybe tends to have some slight misconceptions around or at least some confusion in that I think we’re all pretty clear that if you on a certain meal, a mean with a high amount of carbohydrate in it you’re going to have an elevation of blood glucose as you’d expect after that meal but if we’re talking about healthy people that probably going to come back down to baseline and the number of hours after that meal obviously depending on the carbohydrate content. So if we’re going with that for healthy people I suppose the acute increase in blood glucose initially after a meal may not be all that important compared to say the trend of fasting blood glucose over the longer term. If we look at those trends in fasting blood glucose what does the macro nutrients split impart? What sort of influence would that have on these numbers if anything or is that even the right question for people to be asking? Is there a best way to think about the types of macro nutrients in their diet that’s going to influence just glycemic control in the long term as opposed to these acute fluctuations? ALESSANDRO FERRETTI: So I thought, at the start of my research, I thought that the carbohydrate content would have a very strong correlation, positive correlation with the fasting glucose level. Now in some individuals when the carbohydrate are in excess and the person is insulin resistant and then that assumption is often true. However, when I took a sample of healthy individuals not in excess of carbohydrate, not diagnosed with any diseases, what we would define as our version of healthy individuals the correlation with carbohydrate with fasting glucose level was actually very poor. So I had to rethink completely once more what I was researching because I had to once again put things into a different context because I changed the subset population and I wanted to make it a little bit harder on us and that’s the reason why I took people on a healthy diet mostly eating vegetables, so a well formulated diet whatever that may mean. And generally speaking none of these people had an excess of carbohydrate. So it ranged on a kind of Mediterranean macro all the way to straight ketogenic and across the group as mentioned the correlation was very poor. So the fasting glucose as per your question I think in health individuals is very heavily affected by the baseline insulin and all the inflammatory response which obviously may tend to go hand in hand for most of the times but at time we find some discrepancies not very often. So that’s the reason why we started to think there is so much more affecting glucose level than just the carbohydrate kind of level and this has been engrained in quite a lot of people for the last three/four years since the explosion of a low carbohydrate approach and ketogenic diet approach where people keep constantly referring to carbohydrate fa…sorry glucose fasting level to the carbohydrate that they had and especially the day before. So when I started to mine the data and correlate these two, the correlation was exceptionally poor. And I’m sure you may have come across this yourself Danny, you hear people or yesterday I had instead of 40g of carbohydrates I had 60 so I had extra 20g of carbohydrate. In fact, today my blood glucose is elevated. Well, in my simplistic view, if you do the Maths right, so let’s assume someone stops eating at eight o’clock in the evening, let’s give him the benefit of the doubt to eat very, very late. If the body cannot process 20g extra of carbohydrate in ten hours I think the person has way bigger problems to worry about rather than a slightly elevated fasting glucose level. And if you do the Maths, it makes no sense on caloric consumption. In fact, when we ask these people to measure their fasting sorry their glucose level prior retiring, prior going to bed generally was lower than the fasting in the morning. So unless they sleep walk and go to the fridge and stuff themselves with stuff then it doesn’t make any sense. There must be other mechanisms so depending on the subset population, if the carbohydrates are in excess or actually if the two values are in excess and there is inflammatory response then the fasting glucose is probably one of the thing that I would definitely want to measure. If the person is healthy probably the first in glucose level is the one that I would personally consider more important to measure. Then people want to see their reaction to a meal, to a specific meal. So I for example have a very delayed and large area under the curve when I consume grains, healthy grains. So let’s assume these gluten free, organic and you name it is in and my body doesn’t seem to respond to grains nowhere nearing the same manner that would respond to couple of bananas which if you think I should have in much higher peak on the bananas and then dropping down crushing. Well, my body doesn’t crush at all. It just has this peak, not too high, it would then go down to the mean within 30 to 45 minutes whereas if I had grains, it can just be elevated for hours. In other individuals, it’s virtually the opposite. So there are individual variations and these individual variations are very important to then set in a protocol on what to measure and when to measure. 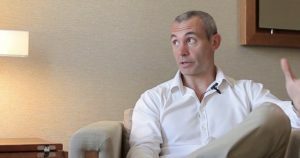 DANNY LENNON: A couple of the first few things that pop out to me as you were going through that Alessandro I think one, an important point that you mentioned is if we’re looking at these healthy individuals then of course over the long term fasting but glucose can really indicate something to us. However, like you said, trying to take from that or interpret something correctly is a different thing. So like you quite mentioned people have this maybe idea that, oh the reason why my blood glucose is elevated today as opposed to what it usually is, is probably just because I ate a small bit too much carbohydrate yesterday which doesn’t seem to really pan out when you look at both physiology and just general data that you have. So it then throws up some of these interesting question to say, okay if it’s not because you had just a small amount extra of carbohydrate yesterday then what is the reason for this out of the norm elevation of blood glucose and then you can start actually piecing through what might be causing that. And so we’ll certainly get to some of those factors that may influence that you mentioned one there, inflammation. I certainly want to ask you about that. There’s a few others that we can probably touch on. Before that you also mentioned this individual glycemic response that different people can have, your example anecdotally of the difference between grains and a banana where someone else might be the reverse. I think it was either last year or the year before the paper, I can’t remember the author’s name, I think it came out of Israel. I’m sure you saw where they looked at this kind of personalized nutrition and again they saw very similar things in their data sets. People with opposing glycemic responses to say a piece of fruit versus a cookie and then someone else having their curves just flipped around so I think we definitely see those individual glycemic responses. I’m just interested to hear your thoughts on for one given individual that has a certain glycemic response to a food. What is the actual long-term health implication of consuming a food that they do have this elongated glycemic response where it stays maybe elevated for much longer than we would have predicted or that we’d assume or that person proportionally eats and maybe produce more insulin to bring glucose back down to normal? For a healthy person does the acute glycemic response after a meal have a very clear impact on overall long term health and if so in what manner would you classify that? ALESSANDRO FERRETTI: Right, I’m going to be making some assumptions so people may need to sit down a bit, I guess. So we think that you mentioned…you clarified beautifully the question by saying in a healthy individual, so assuming that a person is not after reducing insulin load, we can use that very cleverly. So for example in a maintenance program for an athlete at times in which we want a constant low supply of substrate of carbohydrate for example, in an acute phase of an inflammatory response where IGF 1 and insulin are parts of resolving an inflammatory response. So the long term consequences if they are used correctly and let’s say strategically, I think are positive especially looking at glycogen replenishment and optimization of stored substrate, that would be the application on a positive side. If someone is diseased then we need to see the thing completely turning on its head meaning then the insulin load will inevitably go up. In fact, one of the things that I think it should eventually get standard is not just the insulin response to a meal but is naturally the baseline starting insulin. If you look at the work for example in type 1 diabetes and all the work of different colleagues looking at this is in more depth but this is beyond our conversation. So the long term effect of someone having constantly raised insulin response and he is healthy, I still think that if he is constantly elevated will bring detrimental effects especially as far as aging and obviously something that we want to avoid. If it is used cleverly in order to replenish glycogen stores for example, I have…I’m definitely not aware of any research done on the topic showing that has detrimental effect especially in healthy population purely because it’s unlikely that people measure healthy population glucose response elevation to long term in different types of foods. DANNY LENNON: Perfect, thanks for clarifying that and like you said, we can get into so many other different areas on this that could take it in different directions but to kind of keep us on track I again want to go back to some of those things that may influence blood glucose response because as you quite already mentioned, if we have someone now that we’re kind of clear that okay, just because you had a few extra grams of carbohydrates yesterday isn’t going to have this…isn’t a good explanation should we say for why on a given day your blood glucose is elevated well above what it normally is. So if that’s the case, we can start asking why it is. One thing that you mentioned I want to ask about is inflammation; can you maybe just explain for people who aren’t familiar with this this kind of relationship between elevated blood glucose being due to essentially a ramping up of inflammatory pathways? ALESSANDRO FERRETTI: Sure, in fact I had noticed…the first time I noticed this kind of response is many, many years ago following heavy training sessions where I had a lot of tissue breakdown. I know this that my fasting glucose was substantially elevated the following day as soon as the recovery period had finished then the glucose would go back to normal. I controlled for macro, I controlled for type of carbohydrate, type of fat and protein levels. So I expanded that onto other people and the result came in back the same. So in a healthy individual and this is setting the paradigm, that phrase is the important bit, so in a healthy individual the glucose seems to fasting glucose and the daily average between meals so not post-prandial curve which I have not tested so I cannot make inferences on that seems to be elevated when inflammatory response is present. In fact, we can say that in a healthy individual what affects blood glucose fasting not in a stress response is highly likely to be done to inflammatory response alone. This is a big bow statement which I’m sure that some people are either shaking their head or putting fingers in their ears not to listen but this is what we have observed. So I wanted to do some digging and starting to look at the relationship there is between TNF alpha, necrosis factor kappa b, interleukins especially interleukin 6 and all the effects of these inflammatory molecules for whatever reasons due to injury, due to training, due to inflammation, due to viral action. It doesn’t actually matter but it seems that when this molecule one have an action that is reducing the insulin sensitivity at cellular level it makes in a way sense even if you forget for the second scientific research. In a time of inflammatory response, the body wants to maintain glucose level. It would make sense that the body would want to maintain glucose level higher as far as circulating your bloodstreams and perhaps also switch potentially fuel but these are just mere assumptions so it’s just an idea. However, this still does not derail us the way from the fact that we have observed that once you control in different subset population, they’re reasonably healthy and these people undergo a substantial inflammatory response for whatever is the reason of this inflammatory response inevitably the glucose level would increase. This seems to be down not to an increase insulin secretion’s production but to a desensitization of insulin within the cells. DANNY LENNON: Yeah, very interesting and again like you mentioned there is still a lot to try and tease a part of exactly what’s causing what when we look at some of these associations but I think it definitely throws up these interesting questions and while we were talking about healthy people in one of those disease states one thing I think maybe listeners will remember from a previous episode when I had my friend Phil Graham on the show who is a type one diabetic whose competing in competitive bodybuilding for many years. And again, one of the things that type one diabetics are acutely aware of is when they are measuring their blood glucose is that while some aerobic exercise and quite like can help blood glucose. On the other end, very high intensity work can actually cause these elevations in blood glucose. So does then that throw up if we’re looking at…we’re talking here about athletes and maybe the inflammation response and that is looking at their recovery capacity from training, where do we try and piece apart these elevations in blood glucose from the actual kind of workload that they are doing in training versus their actual inflammatory response or their inability to recover all these moving parts that may be contributing to these different blood glucose if we can at all. ALESSANDRO FERRETTI: Yeah, welcome to my club. Yeah, so one of the things that we do when we measure for example what we call in between prandial fasting glucose. So not fasting throughout the night before but in between meals and away from training is exactly that away from training. So the depending up on the training…so all of our data from all the athletes we follow and actually in general, any time that we are doing aerobics exercise people had much, much lower level of glucose, this is general but then in between meals it will just go back to their mean. In high intensity type of work and I am being very careful in mentioning high intensity and the sense is high intensity with the type 2b activation to which in to a certain extent type 2a, so basically both weight resistence training and high intensity interval training let’s call it, glucose will be going up and after a while a few hours or so it will go back once again to the mean but they are both slightly lower for the aerobic and/or high volume and slightly higher. So this is totally normal, we have observed. So the first thing to do that when we look at someone is what is their reaction to different trainings and what training are they actually doing? And that is the reason why we ask people to measure it away from meals and training unless we want to specifically address that. So that’s the first point I will say to people when they want to check the glucose level. I will say; okay well anaerobic, I call it high intensity type of training will raise it; aerobic high volume will lower it. So these are two things that we need to take into consideration because when I mine the data and correct it for sport and type of physical activity then we could see that the patterns were similar but the levels were different and that was a major skewer of our data. So any time that the body would enter some form of glycolytic type of effort inevitably glucose in the bloodstreams will be in higher level, you want that. So whereas the normal behavior and the patterns these should be reasonably similar. DANNY LENNON: Okay, got you. Thanks for that, that’s a great breakdown. Before we move on just one final thing I did want to ask about on this blood glucose response that I find interesting is like we said before if we have an elevation that’s completely inconsistent with someone’s normal baseline intake there’s lots of things that can influence that. One interesting area that I know you’ve talked about before Alessandro that has started to pique my interest is related to meal timing. And so I’ve started to look a lot through meal timing more as it relates to kind of a circadian rhythms and kind of just chronobiology but this kind of ties into a similar thing in that some of that research indicates something that maybe you thought some before that potentially at least meal timing can influence these glycemic responses to meals the following day. Can you maybe touch on what you’ve seen in this area and what you think we can take right now in terms of meal timing and that’s effect on blood glucose responses? ALESSANDRO FERRETTI: Sure, sure. So couple of years ago when mining the data of a project I set up, one of the things that with my colleague Weko Jares, we have observed was that the time of eating…you know you always start from an n=1 or often start from an n=1 and I thought, okay that’s strange because every time I eat later or later not necessarily late fasting glucose level is elevated and once again, I’ve done the Maths and I thought well it makes no sense that is because the body hasn’t had the time to dispose of that glucose because otherwise I have a substantial metabolic problems that go beyond the problem we’re having, high fasting glucose level in the morning. So interestingly and this is where the work of Bill Lagakos, he actually coming completely parallel and me not knowing about his work actually in a way put some substance to what were our preliminary findings was that the time of the meal seems to affect what is the regulation of blood glucose level the following day but also this as we might see later how also effect of heart rate variability. So that means that potentially we have both a kind of inflammatory response and/or a sympathetic activation. I’m saying and/or because normally they go hand in hand but not always. So generally speaking there is a soft spot between 4 and 6 o’clock in the afternoon when people have exhibited a reasonably low within range closer to their mean of fasting glucose the following day which was not observed if they would eat later on. So I’m not saying that that brought diseases, I’m saying that the glucose was higher and for us the correlation was pretty strong. So that could not be ignored. So I started to research a little bit into the chronological aspect and circadian rhythms and it seems that first of all there are studies actually showing that obviously later on in the day the body is keener to store and to process food differently from what it would be during the day. So you have hormonal changes, you have digestive changes and et cetera. In addition to that, later meal at night had the strongest correlation with the lower level of deep sleep. We measured that reasonably empirically with an Oura ring but even going all the way to self-reported data which is even more empirical. We had people that noticed that when they were eating earlier they would sleep better and they felt more refreshed. In fact, there is a book that just recently come out called, “Why we Sleep,” from Professor Mathew Walker which has explained and highlighted and reported some of the papers I’ve found looking at late meal eating and how that would disrupt the sleep which then in turn would disrupt the blood glucose. And this is a very different paradigm to I’m eating late therefore the body has not enough time to process the food therefore I have a higher fasting glucose. It goes there through the sleep in our observation and some of the kind of assumption that we made. DANNY LENNON: Yeah, that’s amazing and like I said this is another thing we could probably spend hours talking about because I’ve become just completely fascinated with circadian rhythms, chronobiology, all that type of stuff. Particularly now we’re starting to see the emergence of potentially nutrition being a zeitgeiber and influencing that but for the sake of this conversation I do want to get onto some of the other things I’d set out to ask you about. So now that we’ve kind of given a fairly lengthy primer on blood glucose and some of the ideas around that the kind of second part to this was some of the work you’ve done with HRV and particularly using that in conjunction with blood glucose. Before we get there maybe again just to give someone some baseline knowledge of what we’re talking about with HRV or heart rate variability. Can you maybe just break down what is HRV and then what does a certain HRV number tell us? ALESSANDRO FERRETTI: Sure. So heart rate variability basically measures the variations that there are between heartbeats. So we assume that the body, our heart beats very regularly though in action fact there are very subtle and small variations and in these variations have been discovered to give us an understanding of the sympathetic nervous system activation. I first came across it via an app called HRV for Training and Elite HRV and because I was interested in monitoring physiological trends in relation to my training and then started discover to the whole world of heart rate variability. So heart rate variability in a nutshell gives us an indication of the sympathetic nervous system tone and the wider is the variation the better and more rested is the actual heart and the sympathetic nervous system. So the central nervous system is divided mainly in sympathetic nervous system and parasympathetic nervous system. So the sympathetic side is the do, go, get and et cetera. The parasympathetic is more associated to recovering, resting, healing and so on. So when we see a person that is highly stressed out or exercising for example, the heart rate variability drops substantially because there is this sympathetic activation. When we are at rest and relaxing, meditating and so on, we should see a much wider variability. So this is a nutshell what heart rate variability is or how it can be used for the purpose of today. DANNY LENNON: Perfect. So that probably leads us on nicely on how you started to use both HRV and blood glucose in conjunction to give some more informative information. Can you give people kind of a breakdown of why you started to merge these two numbers, how you went about that and then some of the data that you were collecting? I was trying to piece together this relationship between HRV and blood glucose and how that may inform us of certain recovery markers and so on. ALESSANDRO FERRETTI: So I started to notice a behavior between fasting glucose level and heart rate variability. So heart variability had two domains; one is time and the other one is frequencies. Now at the time I was only looking at the time domain because it’s easier so virtually every heart, no I rephrase that, most of the heart rate monitored a precise enough or some of the new devices on PPG. Measurements can give you a very good estimation of the time domain but may not be many of them precise enough to look at the frequency domain. So I looked at the correlation between fasting glucose and heart rate variability and the correlation was moderate to high but at times that correlation brought down and this was particularly relevant for endurance athletes. So not athletes that do high intensity type of sport but for athletes that do more of the high volume low to medium intensity where the heart rate variability is amongst the highest values and the glucose theoretically should still be within a certain mean. But unfortunately this is not what we found in the athlete we were following. One of my colleague, Professor Daniel Plews, from the New Zealand tem he is a coach, he is an international coach, sent me three at the beginning of the year a month worth of data from a current Olympic champion and the values were most of the times in the pre-diabetic or diabetic zone and that’s really concerning. And this is when I started to make some connection to merge my observation between inflammation pushing the glucose up at chronic level to the low grade constant inflammatory response which will keep pushing up the glucose level despite the heart rate variability at times may not be able to pick up that subtle changes within the inflammatory response because the heart rate variability of a person that is an athlete may be already pretty high. DANNY LENNON: So I think there is a few things to kind of unpack there. I think early on we obviously discussed around blood glucose and that kind of relationship with the inflammatory response. We mentioned that in certain exercise that obviously really with any intense exercise you have this acute inflammatory response and you have these changes in glycemic response to that but again it’s more this chronic picture we’re interested in. So we’re now talking about this chronic low grade information that if it’s constantly present even in that rested state it may be influencing blood glucose so now we’re using this I suppose essentially cross referencing the HRV and the blood glucose to give a better indicator of that inflammation and the recovery processes going on, right? ALESSANDRO FERRETTI: Correct, correct and we can take that a little step further because what we have observed is that especially in endurance athletes the heart rate variability…don’t get me wrong, the correlation was very strong between the two so the higher is the heart rate variability the lower is the fasting glucose closer to the mean. It doesn’t seem to go that much lower. So it’s always between the 4.2/4.6/4.7 so that’s fine. There is a variation can also be obviously take into account depending up on which glucometer they use so there could be some little errors in that. But what we noticed is that if the heart rate variability does not pick up certain chronic changes because the person is very, very fit. Sometimes the glucose can compensate for these times where the chronic inflammation keeps going on and on and on kind of bubbling underneath pushing the glucose up and through tracking the glucose people could be able to pinpoint when that can naturally be detrimental. So I definitely thought that the two could be integrated in a single measure and that is particularly relevant for the rest day of certain athletes, what we found that… So through exercise, body secretes interleukin 6. Oh I should say the interleukin 6 has many different roles which is not only inflammatory. Interleukin 6 can also be anti-inflammatory on top of being pro-inflammatory so through exercise and resolution of an inflammatory response the actual inflammatory process has to encompass the end of the inflammatory process which is an anti-inflammatory effect. And this came to a huge surprise for me Danny and I never felt so ignorant in my life about immune system response. And when people are exercising their exercise and consequential cascade of cytokines especially interleukin 6 seems to keep inflammation at bay. When they have a rest day, if they have a chronic low grade inflammatory response normally the glucose has a huge rebound and I’m talking…so for an athlete is going through a block training of three, five, six sessions during the week and the glucose stays between 4.2 to 4.7/4.8 after the rest day we see these often in the mid five’s, low six’s. That is because… Well this is what we have speculated because the exercise is not keeping the glucose at bay anymore and there is a rebound of inflammatory response which will desensitize cells further to insulin pushing the glucose up. And this is when I feel; hang on a minute, why don’t I actually merge the two? And this is when we created the AFI index. I put the RMSSD on top and I took the time domain that is most easily found purely for compliance reasons and the square of the blood glucose at the bottom of the equation which is really, really simple in order to have an idea of the trends because we don’t often see the small variations between the glucose as a red alarm bell but I think we should give them some importance especially when we track time so an athlete over a period of time. So for example if you have an athlete that is going through a block of training and he is increasing intensity and he is in the loading phase then that’s justified, fine but if we see that in a tapering phase, this is when we definitely need to take action and perhaps investigate a lot farther because it wouldn’t be great if an athlete ready for a specific date of competition in a tapering phase is starting to see a low grade inflammation constantly there but it is not resolving. DANNY LENNON: Yeah, really interesting. So a couple of things first just to recap on that so that we’re all clear on it. Based on what we’ve discussed with HRV and blood glucose and then some of the correlations you were seeing with those two different markers we essentially now have this metric key you have of heart rate variability, blood glucose index and you said that with the…you basically had a formula to work that out I think to the root mean square standard deviation of HRV over the blood glucose squared I think. DANNY LENNON: Perfect. So that was your formula, gives you this index and now you can start to use this as more of a predictive myracove when we’re seeing this consistent low grade inflammatory response that’s going on that may be problematic. So the kind of next kind of obvious question from there is and I think you started to allude to it at the end of your answer there was what you can actually start doing with this. So if we see this certain number is going to tell us a certain piece of information but we have an athlete who particularly for high end athletes are always going to have pretty high workloads, are going to be doing a lot of things that are pretty difficult to recover from, what can we do then with this information if we are seeing a number this index that you maybe don’t like, what are the first things to check that may be able to be modifiable to get this back to where we want? ALESSANDRO FERRETTI: Yeah, great question. This is where you know opens up to very different protocols. So for example if someone is finishing a loading and for the following two to three days we see a reduction in the AFI index, then I think he’s still justified but if you start to still see a very low score, 5/6/7 days in, maybe there are other things affecting. Perhaps there is an underlying increased risk of injury. I definitely know something about it given that I just snapped my ACL as you know. And so for example if you look at the trend and despite it improving the score is still nowhere near where it started at the start of the loading phases then there could be an inflammatory response due to infection for example or perhaps the person from a HPA access is not coping very well. So the person is fit especially in high volume type of effort yet the mechanism of coping that the person may have, have perhaps reduced effectiveness. I’m very wary of using the word exhausted because when people mention adrenal exhaustion I tend to kind of blank out a bit but you know what I’m trying to say. So is it coming from the hypothalamus, is it coming from their perception of their environment or is it coming from their adrenals and right now it’s very hard to quantify unless you have ACTH values in order to look at. So for example I think was one of the trainer and coaches that was very recently on your podcast. He mentioned that one of the college athletes that this trainer was actually following had major college problems they were affecting his performance and he was measuring heart rate variability. Well, ideally if he has gone all the way down affecting HRV I think we can use the index in order to try to detect that perhaps a little earlier. And sometimes at this level, two/three days earlier could be the difference between getting a major injury versus maybe just pulling a muscle, could be the difference between being very, very proactive rather than being reactive when things have already gone wrong. DANNY LENNON: For sure and I think that’s one of the big criticisms that you see leveled at HRV for trying to monitor athletes. In that by the time it’s consistently below what you’d want it’s almost too late, right, because there’s this like delayed lag time for showing up to what’s going on with the athlete. So I think any measure that may be getting us close to that is for sure interesting. And just finally before we start wrapping this up Alessandro just purely out of interest obviously this is really interesting the data you’ve been able to collect, piece through and trying to start work out some of these markers and now look for correlations, what’s the next step with this? Is there any kind of plans to push this on, try and get other independent researchers to try and validate the model or to get in pure viewed research, what’s the kind of plan for some of these interesting metrics that you’re working with? ALESSANDRO FERRETTI: Yes, precisely. So Dr. Daniel Plews is…and I, Weko and possibly Dr. Tommy Ward are wanting to basically put this in a much more controlled way into scientific papers so not just our observational projects that we have carried out this is my third one and is very, very consistent. So all the data at preliminary level is great but we wanted to classify so Daniel has put together already a proposal that has been sent out and we’re just waiting to hear from different journals how to you know what is their response and if he is of their interest. If this doesn’t quantify then we have a couple of PhD students that are seemingly very excited to put this into the thesis for further validation. I think it would be…because it is a process that can be very easily automated even at app level especially when potentially in the near future we would be able to measure glucose non-invasively via a kind of PPG version of reading through the skin. This would be a great way to perhaps detect that. So we think that a scientific paper on food validation this is where we are actually heading right now and we are just waiting to hear some of these responses, so very excited. DANNY LENNON: So with that Alessandro we’ll start wrapping things up. Before I get to the final question for anyone who that’s interested in finding more of your work or contacting you online, where is the best place for them to find you online? ALESSANDRO FERRETTI: Is my full name, so AlessandroFerretti.co.uk. There is nothing to sell just you know it just for didactical purposes or on Facebook where I either post myself or repost scientific data from people that I think could be of interest of the people that follow my work. DANNY LENNON: Perfect and so for everyone listening I will put all of that stuff in the show notes to this episode so you can go and check that out which I encourage you to do. And so with that we come to the final question I always end the podcast on Alessandro and it’s simply what one thing would you advise people to do each day that would have a positive impact on any area of their life? ALESSANDRO FERRETTI: I’m very biased. I’m writing a book about it. Go back to basics, address the basics first. So often I see and coach people. So get your circadian rhythms in line. Eat proper, genuine as close as possible to nature food then people can go onto vegan, vegetarian, high-protein, low protein, ketogenic but one thing, basics have to be addressed. People looking into genetics well if you’re not sleeping well, if your circadian rhythms are out, if you have not addressed the basics in my understanding and in my experience has very, very little importance or a very limited importance I should say. So to me sleep well, look after your sleep, look after your circadian rhythms and eat proper food. That to me is the thing I definitely want a good advice to people. DANNY LENNON: Perfect and a great way to round this out. With that Alessandro thank you so much for taking the time you’ve taken out today to come and talk to me and for the great information you’ve given people. It’s always fascinating to hear your thoughts on things and to see the work that you are doing and like I mentioned out of the show the questions you are trying to answer and the way you’re taking a slightly different approach leads to these interesting questions. So I appreciate the work you’re doing and I appreciate your time and thanks so much for joining me on the show today. ALESSANDRO FERRETTI: Has been an honor, will always be my honor Danny and thank you for keep your podcast with such a great work from all the other people I listen, is absolutely fantastic.